" ...Assuredly, if the Austrian State had not existed for ages, in the interests of Europe and indeed of humanity itself we would have to endeavor to create it as soon as possible ... "
This quote is from a letter František Palacký wrote in April 1848 declining an invitation to join the Committee of Fifty, which was to participate in the All-German Constituent Assembly. This letter highlights Palacký's belief in a union of nation-states under the Austrian Empire's aegis with the very Romantic ideal of political equality and religious freedom (Zacek 25). This was an ideal not based in reality. Austria was an authoritarian government and even within Bohemia's governing diet all was not equal. The diets were made up of representatives from all the estates: prelates, lords, knights, and cities. The voting process weighed against the cities so the aristocratic classes of prelates, lords, and knights were favored (Pech 9). Palacký's idealism and belief in a historic destiny for Austria would be, as we shall see, shaken by the reality of the compromises the Habsburgs would later make to preserve the integrity of their empire at the cost of the Czech aspirations. At this time, the lands ruled over by the Austrian Habsburg Emperor Ferdinand I and his Chancellor Prince Metternich were organized along a highly centralized administration. To minimize local control of regional government a province would have a diet to represent the people. There were, however, no central governing groups at the larger state level. In the United States, this is akin to a local county (or province) retaining its legislature, but no longer having a senate or assembly at the state level. The counties therefore are directly beholden to the federal government with shorter reigns to control them. In reality, these provincial diets were largely ineffective, serving mainly to "rubber­stamp" the emperor's orders (Pech 9). Prague, being something of a gathering point for many Slavs, was the natural choice for the Congress to take place. Palacký became president of the Congress and invitations were made in a variety of languages spoken by the Slavs; Czech, Slovak, Slovene, Croatian, Serbian, Polish, German and French (Pech 124). Notably, Russian Slavs were not invited. While it was contemplated, no invitation was ever issued. The irony of a pan-Slavic meeting without representatives from one of the largest Slavic populations apparently did not seem to bother many of the leaders. Mikhail Bakunin, the Russian Revolutionary and a cleric, Miloradov, from Bukovina did attend, but as one of the delegates representing the Polish-Ruthenian interests (Pech 129). This only managed to draw more criticism to the congress, and Palacký himself was not pleased with Bakunin's presence. Although the Poles and Czechs had common ground regarding their feelings about Germany, they were at odds over the Magyars, who the Czechs resented, but the Poles counted as friends. The Poles regarded the Austrians with hostility as, along with Germany and Russia, they sought to control Poland. Meanwhile, the Czechs courted Austria with Palacký’s vision of a federation. The Congress would deal with Slavic interests by sections, with each section choosing a leader. Pavel Safarik, Palacký’s old friend, headed the Czech and Slovak section. Karol Libelt led the Poles and Ruthenians and Pavao Starnatovic led the South Slavs. There were 340 delegates in all with 500 official guests (Orton). applies to a Slavic association for mutual defense. 3. The relationship of the Austrian Slavs with other Slavs. According to the agenda, the congress was not so much about the Slavic peoples in general as it was about Austrian Slavs in particular. Although other Slavic peoples would be discussed, in addition to other European nations, this particular Pan-Slavic Congress had a very narrow focus. By referring to themselves as "Austrian Slavs" rather than Czechs, while technically correct, is an obvious sign the leaders of the congress were playing down nationalist element, particularly since the permission of the Austrian government was needed just to be able to assemble. Nevertheless, it is also indicative of Palacký’s vision to establish a federation of autonomous nation-states within the Austrian Empire, rather than apart from it. This vision conflicted with the aspirations of other Slavic peoples attending the congress. The Poles, for example, knew what it was like to have their own nation and dreamed of getting it back again someday. Palacký, the middle-class son of a cleric who courted the patronage of the upper classes, was not particularly anti-authoritarian in his attitudes. His plan for federalized Austrian rule suggests that at this time he wished to work with the Austrians, not against them. Palacký at that time also saw the Germans as the main opponent to Czech nationalist aspirations, so it is not surprising that he would seek favor with the Austrians under these conditions. Ethnic groups of the Austro-Hungarian Empire. Palacký was now entering the height of his early influence as a national figure. Count Thun, the Governor of Bohemia, made Palacký a member of an eight-man provisional executive council and appointed him to draft a constitution for a constituent assembly to be held in July (Zacek 26). This was to counter the All-German Constituent Assembly in Frankfurt in 1848; however, the riots that erupted in other parts of Europe soon came to Prague by mid-June. With the country under martial law, Palacký went to the constituent assembly held in Vienna that July. His plan to federalize the multi-national empire around a strong central government was discarded (Zacek 26). The idea of a central government is telling of the limits of Palacky's nationalist vision. Indeed, it gives insight to the quote that he made in response to the invitation to the All-German Constituent Assembly earlier in the year. As soon as Palacký's entered the political arena his political fortunes began to change. Count Thun, who appointed Palacký to the provisional executive council, was relieved of his duties as governor, having incurred the disfavor of both the Czechs and the Austrians (Pech 165). Palacký himself would also feel the displeasure of both the Austrians and the Bohemian Estates. 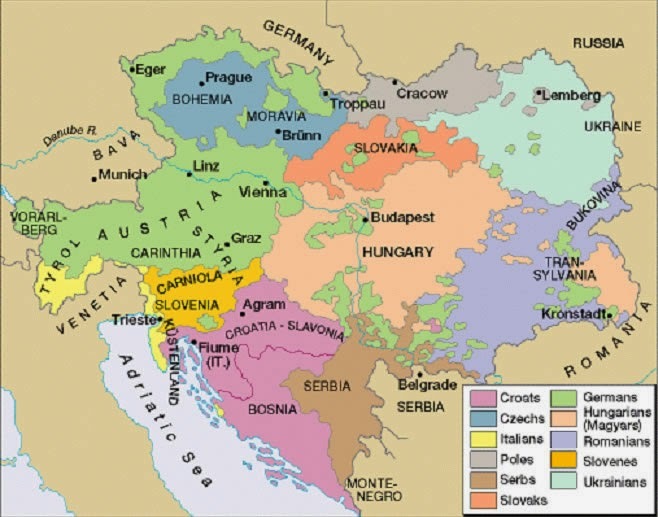 His proposal for the federalization of Austria decentralized the power of the crown and compromised the historical feudal rights to the land of the Estates (Perman 10). In reaction to the upset caused by the revolutions of 1848, Austria responded with an assertion of absolutist rule. From 1851 to 1860, Palacký was "exiled from the press of national life" (Zacek 26). Watched by the police, in danger of being arrested and jailed, and abandoned by friends, Palacký withdrew from his family and continued writing his History of Bohemia. Harrison Thompson asserts in his 1953 book, Czechoslovakia in European History, that Palacký was not given permission to enter Prague to be with his wife on her deathbed (Thomson 212); however, Joseph F. Zacek, author of Palacký: The Historian as Scholar and Nationalist (1970), in a personal interview with myself, disagrees with Thomson on this point. By 1860, Emperor Franz Josef decided that the course of absolutism taken over the past ten years had not been a great success. This was due in part to the great opposition to it voiced by his opponents. In response, the emperor issued a proclamation that the government would return to a "constitutional system" (Thomson 212). On the twentieth of October, 1860, the so-called October Diploma created a federal constitution, despite the opposition of the Hungarians (Burne 932). The February Patent of 1861 sought to assuage Magyar fears by granting a number of concessions. These, however, were rejected by the Hungarian Diet (Thomson 213). This set in motion the series of events that led to the creation of the Dual Monarchy and great disillusionment by Palacký. In 1861, Palacký began to appear on the political scene again. In April of that year, he became a life member of the Lords of the Imperial Diet, but felt "isolated and ineffectual." He quit the Imperial Diet in September and soon joined the Bohemian Diet as leader of the National Party in the Bohemian Diet (with his son-in-law František Rieger) also known as the "Old Czechs" (Zacek 27). Events throughout the early to mid-1860s were unfavorable to Austra and would precipitate the Ausgleich of 1867. Austria's loss in the Austro-Prussian War of 1866 put the Hungarian’s position to press their nationalist aspirations. The Ausgleich (Compromise) granted Hungarian autonomy on a theoretically equal level to Austria with the concept of the "Dual Monarchy" (Zacek 27). Emperor Franz Josef, who suffered the loss of prestige by losing the war in 1866, followed by the "Compromise" granting Magyar autonomy in 1867, was in no mood to listen to Czech claims to restore the Bohemian Kingdom to the same level the Hungarians recently been given (Thomson 214). For another generation, these words would be on the lips of Czech nationalists. They would also turn out to be very prophetic, for little could Palacký know that the Czechoslovak nation would rise from the ashes of the Austro-Hungarian Empire. In response to the Ausgleich in May 1867, Palacký led a delegation to Moscow to the All-Slav Ethnographic Exhibition (Zacek 27). His intention had been to stir Pan-Slavic interest among the Russians, but he had no success and became disillusioned with them as well (Thomson 216). In 1869, Palacký‘s son-in-law, Rieger, tried to interest Napoleon III in the federalized version of the Austrian Empire to counter Prussia (soon to become part of a unified Germany). Unfortunately, this effort just invited more persecution from the Habsburg court as political imprisonment and a curtailment of civic liberties soon followed. In short order, Italy and Germany were unified, Hungary was elevated to an equal level with the Austrian crown, and the dreams of federalization were gone. Palacký, who died in 1876, spent these remaining years contemplating his life's work and the future of his people. In the end, he acknowledged the mistake he made supporting the Habsburg Empire earlier in his life. He saw a "new Thirty Years' War" in the Czech future (Zacek 27); World War I would be that war and the result was Czech nationhood with their Slovak neighbors. "History in general is the final temporal judgment over those who distinguish themselves by their activities on the world-stage, a human judgment, of course, and therefore neither infallible, nor sufficiently competent..."
Here, Palacký is voicing his awareness of the role he had played in recent nationalist history. He also seems to be "hedging his bets," so to speak, in case history had a less than favorable view of him. His life's great work, The History of Bohemia, was finally brought to a finish during these final years. Palacký‘s level of scholarship and dedication to his craft would have an impact on Czech historiography and his words would influence a new generation of Czechs who would live to see their national aspirations brought to fruition. These new Czech leaders, the "Young Czechs," saw their opportunities for power first manifest after the failure of the attempts by the "Old Czechs" to bring their plans for federalization into existence (Thomson 221). Thomas Garrigue Masaryk (1850-1937), first President of the Czechoslovak nation, was a self-proclaimed "disciple" of Palacký who studied Palacký’s philosophy of history. Rather than study the significance of Czech history for the Czech, Masaryk also took it to the next level by exploring the implications of Czech history to the rest of the world (Zacek 105). Masaryk's marriage to an American woman brought a wider variety of English and American ideas on philosophy and politics to influence his thinking. Masaryk' synthesis of these ideas, as well as being able to see the larger implications of Czech history, made him an apt and formidable choice for first president of the Czechoslovak nation. Palacký’s History of Bohemia, was more of a Czech history than a history of all the people who lived in Bohemia. The Sudeten Germans picked this up immediately. This lack of inclusiveness exposes a bias on Palacký’s part and left him open to criticism. By the last 1930s, the problem of the Sudentenland gave Adolf Hitler the opportunity for conquest. Palacký’s legacy was now in full flight; monuments to his memory were removed, streets and places named in his honor changed, and his books burned (Zacek 107). Gradually, in the latter half of the Twentieth Century, Palacký began receiving more favorable attention. The Soviet’s, while not exactly appreciative of Palacký’s feelings about Russia, did endorse his view regarding the German threat. Masaryk helped the Czech see the larger implications of Palacký writings. True, Palacký’s life did experience numerous political failures: the failure of his repeated attempts to put forth his federalization plan for Austria, the failures of l848, his "internal exile" in the 1850's, his disillusionment with Austro-Hungarian Dualism, his experience with the Russians, the many years wasted courting Austrian favor that never manifested. In many ways, Palacký’s failures were inevitable; the times he lived in were just not the right for the political manifestation of Czech independence. It was too soon, the leadership needed to run a modern nation-state was just not available. If Palacký had been more militant in 1848 and advocated open revolution, the Czech people would have suffered more and Palacký’s life much shorter. Palacký’s legacy is that he embraced the knowledge of his ancestor's to lead his people into the birthright of nationhood. Like Moses, he never made it to the promise land, but by showing his people where they came from – and by contributing to the advancement of their culture – Palacký prepared his people for their future. S.A. International Publishing, 1989. Print. University of North Carolina Press, 1969. Print. Perman, D. The Shaping of the Czechoslovak State. Leiden: E.J. Thomson, Harrison S. Czechoslovakia in European History. Princeton: Princeton University Press, 1953. Print. Zacek, Joseph F. Palacký: The Historian as Scholar and Nationalist. The Hague: Mouton & Co., 1970. Print. ---. Personal interview. 2 Dec. 1999.